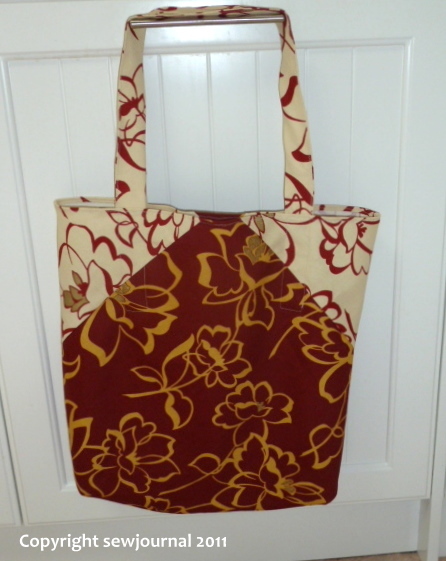 When I was making the shopping/project bags for the Flood Appeal Auction I made them up as I went along. Anyway I decided to make a third one for my friend Sylvia and to photograph the project as I went along so I could write a pattern/tutorial. Anyway Sylvia received her bag the other day so I can show you a picture of it and hopefully, if I get my act together, a pattern shouldn’t be too far behind. Cute cute cute – how big is it?? Looks like a nice shape too! Your bag is gorgeous, beautiful dimensions. I love bags !! Hello everyone. I’m here to tell you this is a great size for a bag. I’ve already used it several times. I’m so blessed to have Munaiba for a friend. so very generous!